Yesterday I was invited to attend a Bridal Shower. I love celebrating the accomplishments of my friends. I was able to catch up with some friends I hadn’t seen in a while and I realized how awesome it was to hear goals and accomplishments being met. I also realized that I am blessed with great friends. Growing up, we moved around a lot and because of that I didn’t have a lot of long lasting friendships. It’s been easy for me to keep people at a distance simply because that’s what I’ve been used to. As a result of that, I never developed long lasting friends until college. We may not talk to each other or see each other regularly but I know that there’s a lot of substance and value in the friendships that I have with them. Mixing stripes is probably one of my favorite prints to mix and match. For this look I stuck with black, brown, grey and blue. The yellow in this shirt adds a little something extra to the look but doesn’t overwhelm it. 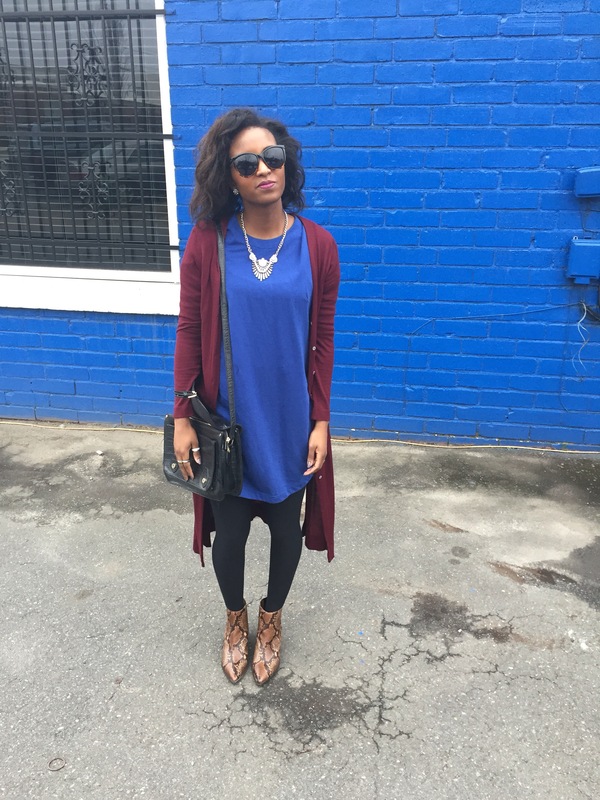 Layering was key with this look. I wanted to add some definition to my waist so I added the black belt to pull everything together. Now that the snow and ice are melting, we decided to get out and go to one of the local breweries. There was still a chill in the air so the first sweater I reached for was this turtleneck by Banana Republic. This turtleneck makes me feel like I’m wrapped in a blanket so it was perfect. Plus these wedged booties were perfect for walking in the snow. Here in the Carolinas, we’re having an ice and snow storm. I haven’t been outside but I did manage to snap a picture from our back door. I hope that wherever you are, you are having a great Friday. We made it to another weekend! Below is probably one of my favorite quotes from Dr. Martin Luther King Jr. He illustrated love when people expected him to hate. He remained steadfast when it was probably easier to give up. We have the power to keep his dream alive by doing the same things. Stay hopeful when you want to accomplish a goal. Remain steadfast when it’s easier to give up. Remember it’s okay to start small but you at least have to start! We have to remember to spread love instead of hate. In this time, it’s hard to do that with everything going on in the world but remember, change can start with you. Sometimes it’s easy to feel small and think your efforts won’t make a difference but somebody has to make a change right? Well why can’t that person be you? I’m right there with you. It’s been rainy and cold here in the Carolinas and we got a little stir crazy just sitting in the house. We decided to try one of the local breweries I town and had a blast! You’ve probably noticed that I don’t really match my outfits and I don’t really have a particular style. I have two philosophies on my outfits. The first one is they shouldn’t be boring or too expected. I’ve believed that since I was little. Matching my clothing just isn’t me. I used to be bullied for a lot of reasons and how I dressed was one of them. Overtime though, I just learned to not really care what other people thought of me. I learned that my unique perspective was a gift. The second philosophy is what I wear should match how I feel. Sometimes I feel really lady like and want to wear a skirt and heels and other times I want to wear a pair of jeans and sneakers. As long as what I’m wearing flatters my body and makes me happy, that’s all that matters to me. I don’t really have a style and don’t fit into a category….and I’m okay with that. If you feel the same way, like you don’t fit into a category, know that you’re not alone. I’m right there with you. This is one of my favorite skirts to wear. It’s so playful and white goes with just about anything. Its been said not to wear white after Labor Day but if you’re like me, you know it’s okay to bend the rules from time to time. Especially when it comes to fashion. I love mixing blue and black together and this white skirt balances the colors out so well. When I first saw this scarf, I wasn’t sure how I wanted to style it but I knew I had to have it. Belting a scarf is an easy way to personalize it. I can’t wait to wear this scarf again! With winter here, it might be tempting to give yourself a break from dressing up. It’s easy to ditch the idea of wearing a dress and substitute it for a pair of cozy sweatpants or jeans when the temperature drops. However, don’t forget about that winter wedding you were invited to. Or maybe you have a special occasion that requires cocktail attire. Whether that event is for work, school or your social life you sometimes you might be required to dress up, even when it’s freezing out! Whenever I’m at an event, I always fear that someone else will have on the same dress that I’m wearing. That’s one of the reasons I love shopping online! One of my favorite websites is http://http://www.sweetywedding.com. I love the variety they have! They cover all of your needs from a wedding, bridesmaid or special occasion dress. These special occasion dresses could be your solution for what to wear if you have a gala, winter wedding or cocktail party to attend. I love how elegant both of these dresses are. This A-Line dress is perfect if you are having a winter wedding. This website even has you covered on bridal accessories such as a veil. These special occasion dresses could be your solution for what to wear if you have a gala, cocktail dinner or a wedding to attend. If you are attending a winter wedding or a special event, I suggest wearing jewel tones such as red, have fun with sequins or beading and always be sure to ask the bride if you are uncertain about the dress code. I knew I had to get these culottes when I saw them on sale. 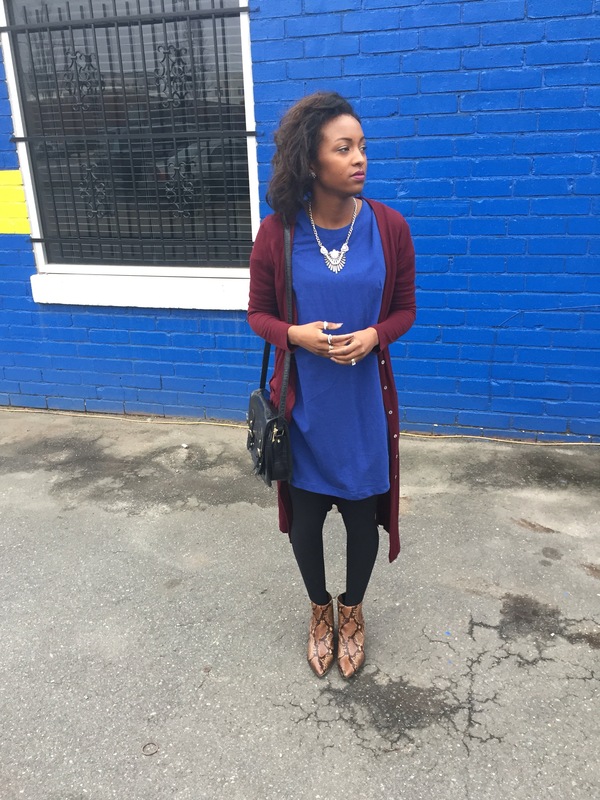 I’ve talked about how important it is for me to have a multifunctional wardrobe in the past. I’m a full time student who is going back for a second degree, full time employee and an active blogger. Not to mention I love spending time with my family, friends and husband. I think whatever your life calls for, you need to have a wardrobe that supports everything you do. 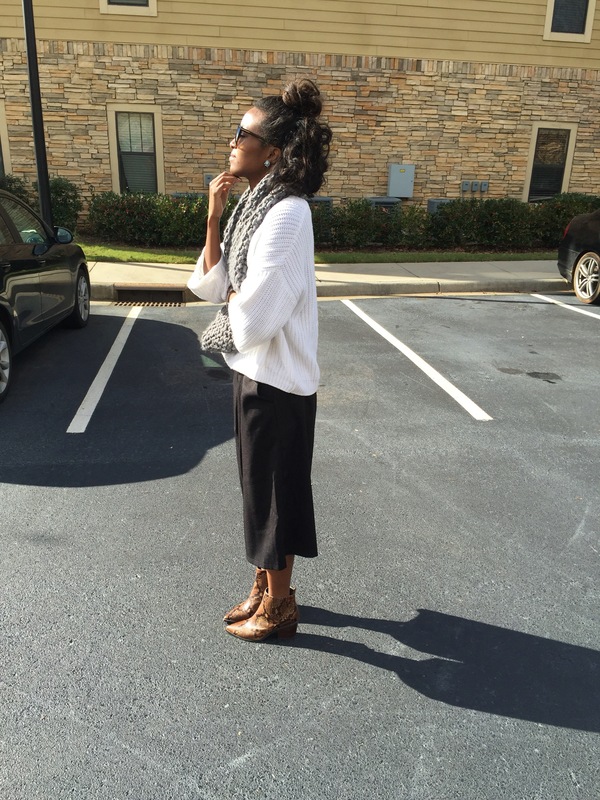 Culottes are easy to style and can be worn year round. You can pair them with a pair of wedges in the summer or boots during the winter. I paired these printed boots with this outfit just to give it some edge. I don’t like for my outfits to be too predictable. I think there should always be an element of surprise. I can’t wait to wear these again!